Sculpture piece; Height 2m; 400＋Origami Butterflies made from tracing paper with letters and envelopes projected on to the installation sculpture. To understand photography is to recognize it as an illusion of light. In 1942 a British soldier and signalman, Arthur Hargreaves, was detained by the Japanese in a Prisoner of War Camp. During his detention his family kept in touch with him by letter. In this sculpture, Butterfly piece, copies of the letters and envelopes sent to Arthur Hargreaves by his family, are projected onto an installation comprised of a cloud of Origami butterflies of varying sizes and opacities. Through the act of projection, the installation becomes a photographic positive, the butterflies carrying on their wings a fleeting imprint of the letters. The flickering images are impermanent, like memories, present for a brief time but then fading and disappearing. The Installation is based on the concept of Renunciation and Forgiveness. 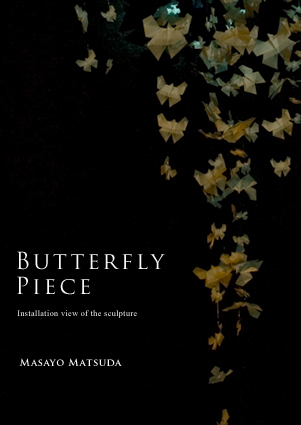 As a Japanese artist, the butterflies themselves signify the act of letting go of the negative memories.